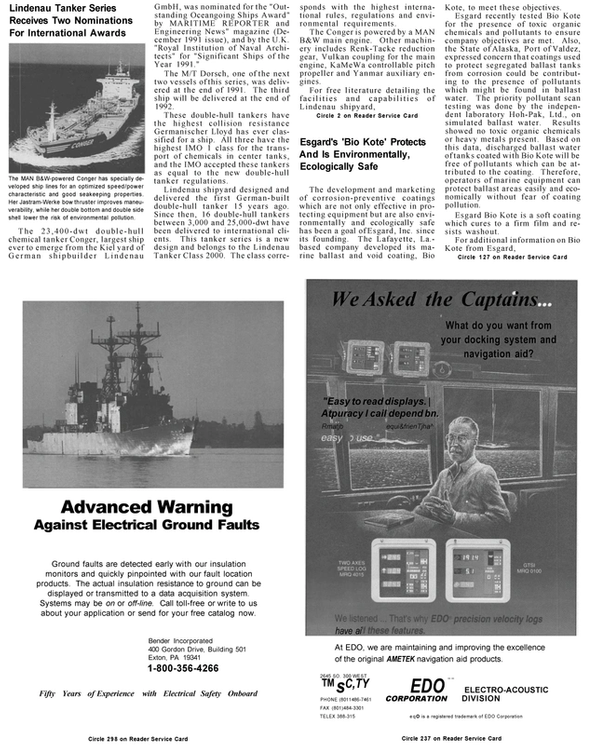 The development and marketing of corrosion-preventive coatings which are not only effective in protecting equipment but are also environmentally and ecologically safe has been a goal of Esgard, Inc. since its founding. The Lafayette, La.- based company developed its marine ballast and void coating, Bio Kote, to meet these objectives. Esgard recently tested Bio Kote for the presence of toxic organic chemicals and pollutants to ensure company objectives are met. Also, the State of Alaska, Port of Valdez, expressed concern that coatings used to protect segregated ballast tanks from corrosion could be contributing to the presence of pollutants which might be found in ballast water. The priority pollutant scan testing was done by the independent laboratory Hoh-Pak, Ltd., on simulated ballast water. Results showed no toxic organic chemicals or heavy metals present. Based on this data, discharged ballast water of tanks coated with Bio Kote will be free of pollutants which can be attributed to the coating. Therefore, operators of marine equipment can protect ballast areas easily and economically without fear of coating pollution. Esgard Bio Kote is a soft coating which cures to a firm film and resists washout.